Twenty-two UAE soldiers were killed during an explosion in a camp near the Yemeni city of Mareb. The Houthis told Reuters they had fired a missile at a weapons cache in the camp used by the Arab coalition forces. 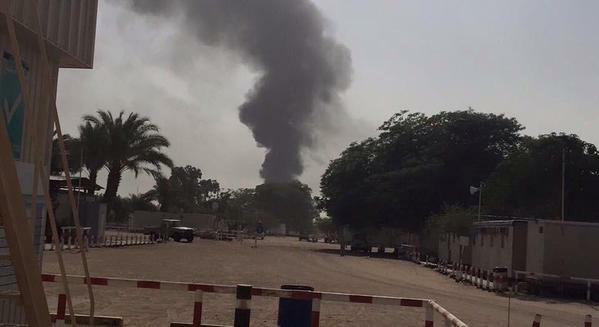 UAE's The National reports the explosion at the arms depot was caused by a fire that led to the violent explosions. A number of Apache helicopters and vehicles were also destroyed. Residents of Mareb told Reuters they saw fire raging at the camp and plumes of smoke. Before the latest incident, at least 5 Emirati soldiers had been killed in Yemen since their offensive to retake territories captured by the Houthis began earlier this year. The UAE and Saudi-led forces are preparing an offensive to break the siege of Mareb by the Houthi/Saleh forces. The strategic city is in the center of the country. It lies 200 km (125 miles) to the east of the capital Sanaa, with a major highway running through it, connecting the capital to points east. UPDATE: The death toll has rises to 45 after 23 more soldiers succumb to injuries, Gulf News reported. UAE says the number has climbed up to 45 now. Were they all killed in a single operation by the Houthis? Yes, an accurate Tochka OTR short-range missile strike followed by Ansarollah land incursion. The real death toll is over 200 Saudi, UAE and Bahrain dead and many wounded. Plenty of footage all over the web. Saudis stirred a hornets nest in Yemen. It's been claimed as a Tochka missile.. Perhaps even launched by the wheel-lacking TEL we've seen before! It caused additional fire\explosions by hitting an arms depot. Ansarullah/Yemeni Army attack at a time Saudi monarch is in Washington. There were also effective ground force tactical strikes against Saudi/UAE forces, as well. The Saudi/UAE ground offensive is suffering setbacks from an adversary equipped with a fraction of their military capacity. How will they manage as an occupation force, if and when that phase occurs? Mark you are very astute observer, the Egyptians in the 1960's were far superior to the Saudis and their mercvenaries, they had at the peak over 80,000 troops and used used chemical weapons against the Yemenis, but still lost with 30,000 dead. Back then the Yemenis had only bolt action Lee Enfield 303, a left over from British imperialism. Today, the Ansarollah and Yemeni army have modern missiles, SAMS,tactical SSM and the most deadly Russian and Iranian Kornets. Iranian version is the more modern KORNET-E which even the Russian defence minister was impressed with when he visited Iran's defence factories. The Saudis are in for the defeat of a lifetime and this war will not end well for them as the Zaidis are the toughest fighters on earth and have nothing to lose since the Saudis are killing their people indiscriminately. Yemen is 40 million people and over half a million sq kms of most hostile terrain and no power has ever defeated the khat chewing Yemenis, who like Afghans and Russian Caucasians just love to fight. Iranian Defense Minister Ahmed Vahidi introduced a new missile called ‘Dehlaviyeh’ thought to be an Iranian advanced version of the Russian KBM 9M133 Kornet missile. Vahidi said the missile is of the most advanced anti-armor and anti-material weapons, capable of destroying stationary or moving main battle tanks equipped with reactive armor. The missile is equally effective against non-armored targets, such as bunkers or buildings, as well as low-flying and naval targets, Vahidi said. He added the missile’s guidance employs an advanced guidance system that makes it immune to current electronic countermeasures. The answer to that is simple:They wont,the wheels are already coming off this "intervention".Time and again I have to wonder:Could this be the beginning of the end of the house of saud?